A point comes in every ones career when they are stuck or their growth is stopped due to some reason. At that point of time it really feels like lost and that is the reason that some of us quit the job or intend to go for an easier, less paid one. But quitting should not be the alternative, you can easily overcome the difficulties if you indulge some of the changes in yourself and this may also lead to a more successful and brighter career. It is common that when you face the tough situations, rather than finding the solution to the problem, you start putting yourself in talks which are against the work. More over you start spreading the negativity in the minds of others. But this may result in a more troublesome environment. For a successful and bright career you need to get some proper guidance and always remember some key points that lead to it. Here we will be discussing some of the important career tips that will help you in your successful career. Yes, you yourself become the most effective reason for your success as well as for your hard times. This is because when many of us face the tough situations, we try to ignore them or run away from them, but the reality is that the more you run, the more you will be chased by the difficulties, and the more you stand and solve the problems, the easier and successful you become. Having faith and belief in yourself is the most important thing in the tough situations. These tough situations are faced by every single working person, even your boss, but the one who finds a way out and finds a solution becomes the successful person. In your career you will be facing both ups and downs so you should have believe in yourself and you should be confident while doing your work, this will make your career more successful and brighter. Professionally this point will come in every ones life that you may feel defeated, a successful person is not that who reaches the top, but the one who reaches the top after being defeated. You should never feel depressed and lost when something goes wrong, always be strong enough and try to improve yourself with every mistake you make. This will in turn make you the most perfect and suited person for the specific job and then you will have a great and successful career ahead. It happens a lot of times when your co-workers and staff members start pulling your leg and your manager gives you a teasing smile when your performance is at the bottom of the graph, at that point of time you need to be calm and quiet. You should not bother about what others are saying and keep doing your work at a pace. As the time goes, your improvement will be observed and you will automatically become the point of attraction from the point of distraction. It is well said that “At tough times the best thing is to remain quiet, and let your success do the talking”. So never waste your precious time in arguments, just limit your mistakes and increase your performance. When you are stuck up in your career and ought to do the same work day after another then you land up depressed and confused about your future. Self motivation is the best way to overcome depressive stage of life and to get a successful career. Start going through motivational business stories, it will definitely keep you boost up for your work and also help you to increase your ability over the going time period. Being motivated always works, in some cases it works late but yes it definitely works. It keeps you away from all the negative thoughts and you are always energetic and efficient in your field of work. More over when you are motivated from inside even in the toughest situations, you work as efficient as the things are normal. More over you also start getting noticed in front of your boss and situations may occur that you may be facing a sudden promotion or appreciation. Being talented and skilled is good for business but being multi talented and multi skilled is the best for business. When you are in your work flow, try not to complain about the new tasks or duties given to you. You should always be ready to work out of your comfort level and start indulging new and better skills which will help you in your work. When you increase your skills you become more beneficial asset for your company and it has been said that an experience worker is good for the job, but in this modern era of technology a skilled person is best for the job. The more skilled you become the more you increase your value in your company. Being skilled always opens the most number of options for a successful career. It is important to be multi skilled but it is also important that the skills in which you possess the most amount of interest should be worked with the most concentrated and focused mindset, so that you master some of your skills. It will definitely take more time as expected but once done it will give you the most benefit out of it. When you come to know about your strength and when you master them, then you become very successful in your company because the perfect work you do with your specific skills can’t be matched by any other staff. When you are in a professional environment, you will be getting across many different kinds of employees. You should always remember that you have been chosen because of your own different skills and capabilities, so you should avoid comparing yourself to others in the professional environment. If you do so it definitely will affect your working image and may result in unfavorable conditions. When you are selected because of your different qualities then it is not worth of comparing yourselves to others, may it be a situation demanding to compare but you should always resist yourself under these tricky circumstances. It is better to start thinking of your future career as early as possible. The clear the road to your destination is the easy the journey becomes. When you plan your career and makes the things and objectives of life clear in your matured age then it becomes very easy to achieve a successful career. What so ever may be your destination you want to reach, you should have it clear and rock solid in your mind. It is not that by deciding over your career will lead to success; it is the determination, will, and hard work that you have put on to achieve your goals which lead to a successful career. If you want to get upgraded, incremented, promoted and noticed in front of your boss then you need to be a bit outstanding in your work. You need to find different ways that you achieve more than the given task and become more profitable for the company. By doing this, your performance will definitely get noticed in front of your seniors, managers and boss which will gradually result in your promotion as well as you will be respected more for your work. This added value also helps you to explore more strength of your working and thus improves your working efficiency. In our education life we are generally taught to figure out the wrong things first, so a majority of us does the same when we are selected for a specific job. It is not like that; practically no one loves or is satisfied 100% with their job. But the solution lies within our mind, rather than pointing out the odds and cursing them day and night, one should always look for the comforts and the positive aspects of the job which will help your mind to remain calm at times of pressure and you will start respecting your job more than ever before. When you start respecting the thing around you, then your way of handling the difficulties and pressure of the job becomes the most effective and helps you to maintain your work performance. It is said that “One Should Never Become Proud of His First Achievement Because If He Loses the Second, Many Mouths Are Standing To Say That He Was Lucky for the First and The Last Time” it means that achievement should be continuous and never stopped, if stopped then it will put you way down to the beginning. If your performance is continuous and beneficial for the company then it is for sure that sooner or later you will be noticed and will be awarded for your continuous performance in the company. Moreover when you become a continuous beneficial asset for your company, the company in turn becomes more beneficial for your successful career. If you really want to get promoted then you should leave all the arrogance behind and try to become the most likeable personality in your office. The more likeable you are, the more attractive your personality becomes. Also it helps to be bonded with each and every member of the company which helps you to know all the ins and outs of the management making your way to the top clearer. Your boss and senior managers will always be pleased and happy with your presence which in return may help in better understanding of the future career with the organization. As it is important to know about your strengths and skills, in the same manner it is very important for you to know all your weakness. When you become aware of your weaknesses you should not run away or ignore them, because it is practically seen that the more we try to hide our weaknesses the more tough situations occur where our hidden weakness are seen by our co workers. So, one should always rectify his/her weakness and try to overcome them as early as possible so that in difficult situations you can easily perform in the best way possible. A majority of us think that asking a question will make a fool out of you in front of others. But one should always keep in mind that “Asking a question for once may make you a fool for once, but not asking a question will make you a fool for life time” so one must be confident and always be clear about his or her queries which will help them in their progressive career. This will also help you to know about certain things, which were unknown for you till that time. A Successful Career can be made easy if followed the right path at the right time. 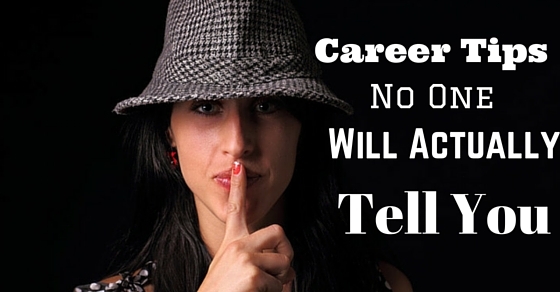 Hope that these above stated tips for a successful career helped you in getting forward in your career. One should have faith and determination for work and should be confident about his efforts, and then there will be no such situation when he or she will even feel that they do not have a successful career. Reading this post will definitely boost self confidence.